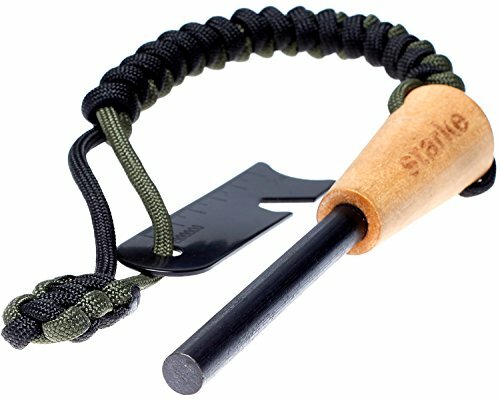 The Stärke Ferro Rod Fire Starter is crafted from the finest ferrocerium and solid maple to provide you with a lifetime of 5500º sparks capable of igniting punk, magnesium, or charcloth when you need them the most. The accompanying multi-tool serves as a steel striker, bottle opener, hex wrench, serrated scraper, ruler, and map scale and is attached by 60 inches of braided mil-spec 550 paracord. Whether you need to start a fire, make a snare, lash a tarp to a tree, or just open a beer at a barbecue, The Stärke Firesteel is a must have for anyone wanting to be ready to face the unexpected. LIFETIME GUARANTEE. Your purchase is 100% covered by our lifetime guarantee-If your Stärke Fire Starter fails, we will replace it. SOLID MAPLE HANDLE. Ergonomic and durable, the hardwood handle provides a much more solid grip while striking your ferro rod than bare rods and is far more durable than plastic. TENS OF THOUSANDS OF SPARKS. Our 5/16 inch thick, 2 3/4 inch long ferrocerium rod will provide over 12,000 strikes producing a shower of sparks in any climate, wet or dry. 60 INCHES OF MIL-SPEC 550 PARACORD. One of the most versatile survival tools available, from lacing up a boot to improvising a belt, knife handle, snare, or lashing on your shelter, you can never have enough 550 cord on your person when an emergency arises. MULTI-PURPOSE STEEL STRIKER. Use as a striker, tinder scraper, ruler, map scale, bottle opener, or hex wrench. If you have any questions about this product by Stärke, contact us by completing and submitting the form below. If you are looking for a specif part number, please include it with your message.